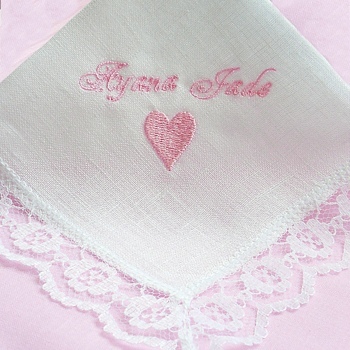 Pretty lace edged ladies personalised Irish Linen handkerchief embroidered with monogrammed initials, a name, occasion or a special message. Pretty lace edged ladies personalised Irish Linen handkerchief embroidered with monogrammed initials, a name, occasion or a special message. Optional choice to add a little embroidery motif like a heart or a cross too! A single white linen handkerchief with a beautiful floral lace border (great as a bridal or wedding hanky!) that you can have personalised with initials, name or a special little message. Just fill in the option box and choose what colour embroidery thread you would like us to use. We can embroider in print or script lettering. We can add a motif such as a heart, holy cross or little flower, just choose from the drop down options menu to select a little embroidery motif.